SCVHistory.com | Pico Canyon | The San Fernando (Incl. 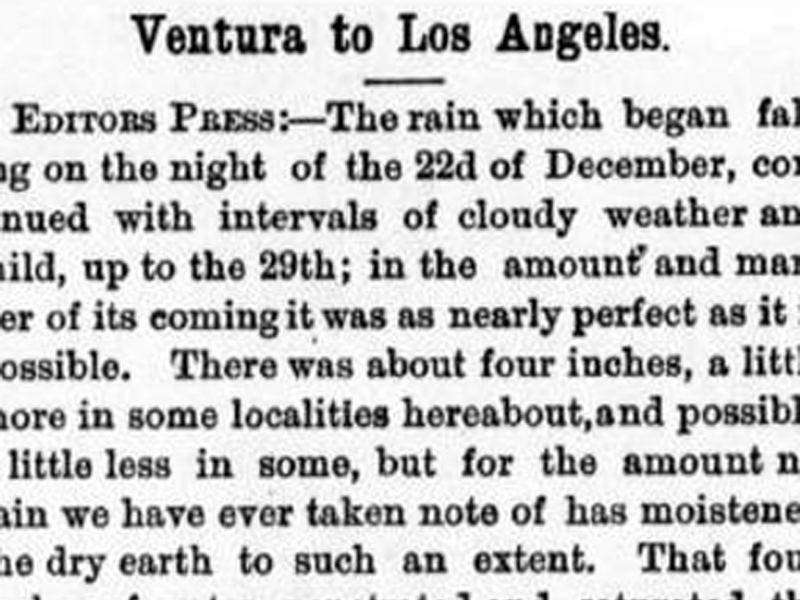 Newhall/Pico) Oil Region, Titusville Morning Herald 1-9-1877. The San Fernando Oil Region. Titusville Morning Herald | Vol. XIII, No. 164 | Tuesday, January 9, 1877. As this was written, the town of Newhall was at its original location (today's Bouquet Canyon Road and Magic Mountain Parkway). The town moved south to the present Main Street/Railroad Avenue area, closer to the water source that fed the Pico wells, in early 1878. "1. The writer arrived at Andrew's Station on December 21, 1876. However, the refinery is at Lyon station. The refinery at Andrew's station (the current Pioneer Oil Refinery) was constructed in 1877, not 1876 as is commonly believed. White (Formative Years, 1962:46) writes that the Andrew's Station refinery was started in May of 1877 and took about three months to complete. "2. Robert C. MacPherson, superintendent of the San Francisco Petroleum Company, started drilling the first well in Pico Canyon using a steam engine in March of 1876. This was on the mountain that would later be called PCO Hill after the Pacific Coast Oil Company bought the Pico Canyon claims of the San Francisco Petroleum Company. Pico 4 would be started with a steam engine in July of 1876. The actual first steam engine in the Newhall Oil District was used in 1874 in Towsley Canyon on the Temple Claim. "3. The first road to (nearly) the top of the mountain was constructed by MacPherson with his 'thirty Chinamen' in 1876. It is not today's existing road and it is not the trail/road up Hughes Canyon starting at Johnson Park. The old road still exists, but is grown over with brush and hard to find and hike. 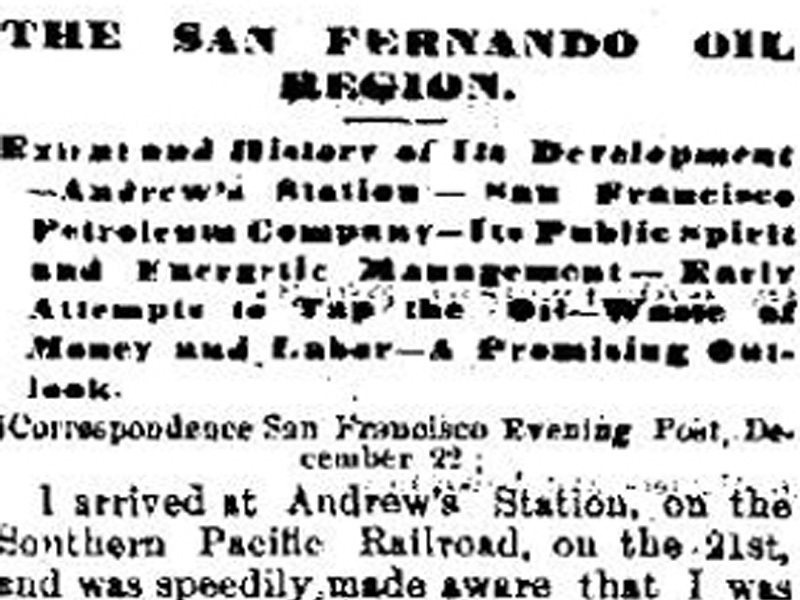 Extent and History of Its Development — Andrew's Station — San Francisco Petroleum Company — Its Public Spirit and Energetic Management — Early Attempts to Tap the Oil — Waste of Money and Labor — A Promising Outlook. I arrived at Andrew's Station, on the Southern Pacific Railroad, on the 21st, and was speedily made aware that I was on the outskirts of the oil region. The line from Los Angeles to San Fernando tunnel lies through a valley of considerable dimensions, and, it is said, of great fertility, but, seen as I saw it, naked and bare to a degree. There was a total want of moisture to make the grass and green herbs spring into life and beauty, and, as the cars rattled along against the wind, clouds of dust were borne in the air, penetrating into every crevice and cranny. Before I left Los Angeles a friend said, pointing in this direction, "They are having a sand-storm on San Fernando plain. That is the way you are going." "Does it extend as far as this city?" I inquired. "Sometimes it does, but it will not blow home to-day. They are having it stiff in Santa Monica, however." Beautiful Monica! How I strained my eyes for the sheen of its blue waters and craved for a puff of its deliciously cool sea breeze. But I was in Los Angeles, the queen city of contrasts, where hovel and palace, so to speak, stand side by side. Adobe houses, mean low and ugly, occupy choice sections beside shops and warehouses which would be esteemed good in San Francisco. In the upper part of the city — the best position — the old Spanish houses are without architectural contrast, and the old Spanish people, or their mixed descendants, live their own life in their own way. Here the past and present meet, and, were it not for the fresh infusion of life and enterprise caused by the opening of the Southern Pacific and Santa Monica railways, it would be difficult to say whether the dead past would bury itself or act as grave-digger for the active present. It is hard to move the inertia of a whole people, and the dusky race which inhabits Southern California, though few in number, possess in a remarkable degree the power of passive resistance. On one hand, refinement and culture; on the other hand, squalid neglect and sun-baked ugliness. A great deal has been done towards making Los Angeles a presentable town, but very much more must be done before that end is accomplished. Visitors to the San Fernando oil region should get off at Andrew's station, where there is an excellent hotel and post office. It is thirty-two miles from Los Angeles, fifty from Buenaventura, 456 from San Francisco, and seven miles from the Pico canyon oil wells. The refinery of the California Star Oil Works Company is situated at Lyon station, about a mile and a quarter further up the valley than Andrew's depot, and here there is a hotel and a station of the Western Union Telegraph Company. San Fernando is about two miles further, on the old stage road to Los Angeles. It does not, however, possess any features worth mention, except that the hostelry is kept by a native of “the land of Burns,” if we may judge from its name, “The Caledonia Hotel.” The general appearance of the country improves about the Andrew's Station, which is situated on a branch of the great Santa Clara Valley, Los Angeles county. Looked at from one of the higher peaks, this part of the country presents a remarkably broken appearance. Sinuous valleys wind through the hills, now narrowing to a gorge or mountain pass, now expanding to plains of considerable dimensions. Dry channels mark the course of winter streams with here and there a water hole to indicate more exactly the line taken by the mountain torrents. Oak trees of noble growth stud the plains, with occasional sycamores and poplars, giving to the valleys a park like appearance. The soil is deep sandy loam, and there is a continual process of denudation going on, the rainfalls of winter and spring carrying down the loose surface soil of the hills, depositing it on the valleys by the overflowing of their banks. In this way the foothills are being gradually washed away and the valley levels raised, the foundation of new terraces being plainly visible along the course of the main streams. At present little cultivation has taken place in this immediate district, but Mr. Newhall's ranch, of some 4,000 acres, carries a large quantity of excellent sheep and cattle. Last season small patches of wheat and barley were grown, and the yield was prolific. Judging from the number of springs in the mountains, the porous nature of the soil, the large watershed, and the fact that water has been got in a well at a depth of some seventy feet, I should conclude that were artesian wells sunk, an abundance of water for irrigation could be obtained. Now that population is being attracted to the district by the oil works and the Southern Pacific Railroad, doubtless the proprietor of this fine estate will see that it is his interest to make an experiment in this direction. I would give far greater value to his land and add enormously to it productiveness. Unless water be had this fine tract of country cannot, as a general rule, be cultivated. A dry season or two would ruin men of limited capital who might take it up; but with flowing wells studded over the plain, the industrious husbandman would make it blossom like the rose, where now it is parched and bare, with few signs of vegetable life. The San Fernando oil region, as defined by prospecting, extends over sever or eight miles of the mountain belt northwest of Andrew's Station. was discovered by an accident, it is said. A Mexican, while hunting on the mountain, wounded a buck, which he tracked into a ravine or canyon, destined in all probability to become as famous in the future of Californian development as Oil Creek has been in the past of Pennsylvania. Close by the dying buck he saw a dark, oily substance oozing from the mountain side, discoloring the water and emitting a disagreeable smell. He reported his discovery, and the use of Petroleum being then generally known, steps were taken to utilize it. Sanford Lyon, an old resident of Los Angeles county, organized a company some twelve years ago to save the oil. The company consisted of Colonel R.S. Baker, General Beale, A. Pico, Chico Forster and S. Lyon, and these located the first Pico oil claim. Mr. Lyon commenced operations by driving a tunnel into the hill, near the level of the stream, at a point where gas and oil were escaping. He drove a distance of twenty feet, and was forced to abandon it by the gas. A well was then dug to collect the seepage, which averaged about two barrels a day. This was all that was done to develop the Pico oil spring until about a twelvemonth ago. The seepage oil, as was to be expected, was a heavy grade. 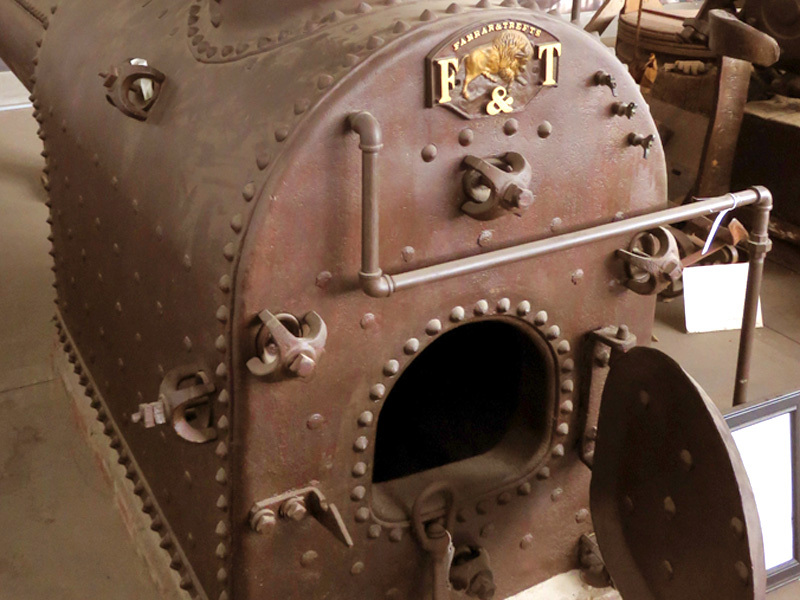 It was shipped to San Francisco, where it was refined and sold as a lubricator. Some five or six years ago a refinery was started at Lyon Station by a local association named the Star Company, but they failed to treat the oil with success, and the works were closed until they passed into the possession of the California Star Oil Works Company, an association of San Francisco capitalists, of which I shall speak farther on. When the yield of oil began to fall off in Pennsylvania several experienced oil operators sought this district as a probable field of supply but while most of them left without doing anything, several of them remained to test it. Of these the most persevering, as he was also the most enterprising, was R.C. Macpherson, who purchased 200 acres on the oil belt running east and west between the Pico well and More well, and organized the San Francisco Petroleum Company, of which more anon. Meanwhile other attempts had been made to get oil. was sunk by the Temple Oil Company in the San Fernando range, about four miles southeast of the Pico. The depth reached was 400 feet. It was found impossible to drive deeper, owing to the light tools and an inferior plant, the engine and boiler being a second-hand Hoadley. A show of oil was had, but after spending sixteen months in doing what, with a proper rig, might have been done in thirty days, and $9,000, the work was abandoned. located in a different point of the range, three miles east of Pico, was ten or twelve years ago a depth of seventy-five feet, when heavy grade oil was tapped. There being no market for the product at the time, it was likewise abandoned. The spring pole and other plant used in boring were packed up the range at considerable expense. This well runs over occasionally, proving the existence of a Petroleum supply at widely separated points, on a line running nearly east and west. at the old well, and 2,300 feet of inch pipe, with a rise of 500 feet, were laid to well No. 2. There are 600 barrels of tankage at the pump station, from which a supply of water and Crude Petroleum is forced to receiving tanks at the upper works by means of a Blake pump No. 3, obtained from Gregory & Co., San Francisco, driven by a steam boiler which was bought for the purpose at a cost of over $1,000. Oil, for fuel, is furnished from the Pico wells at a cost to the San Francisco Petroleum Company of $1.50 per barrel, and the consumption is three barrels per day of twenty-four hours. The receiving oil tank has a capacity of thirty barrels. The oil is fed into the furnace of the boiler by a small pipe, steam being used as an injector. It is the most economical combustible that can be used, but the company expects soon to be able to keep up steam by turning the inflammable gas from the well into the furnace. The gas now provides two very brilliant illuminating jets, which suffice for lighting the entire works. The capacity of the water tank is 250 barrels, and it is kept constantly filled. Pumping once a week suffices for these purposes. There are 14,000 feet of lumber in the derrick and engine shed, beside the cottage occupied by the man. Food, coal for the smithy, water for domestic use, and iron, are hauled up, the freight of these articles forming a considerable item in the monthly expenditure. The rig is made as perfect as similar rigs are in Pennsylvania. Two cables have been used, on the old well and one on well No. 2, each 1,000 feet long, manufactured by Tubbs & Co., San Francisco. The drilling cable is 5½ inches in circumference. There are also two sand cables of the same length used for pumping sand and sediment from the well. since March last. Their public spirit and untiring energy in the face of so many mishaps and losses deserves general recognition. But for the last accident their second well would have been finished five weeks ago; and it is anticipated that a few days sinking after the recovery of the tolls will see them strike oil in quantity. One hundred feet deeper will, in all likelihood, see the test completed, which must have a stimulating effect upon the whole district, as, indeed, the perseverance of the company has already had. If it had not been for the spirited example of the San Francisco Petroleum Company the San Fernando oil region, which now promises so well, would have remained unexplored. But this I shall speak of in another letter. 1. Caledonia is a poetic name for Scotland, the country of poet Robert Burns. —S.W.